Experimental plume of carbon dioxide-enriched seawater and a dye tracer flowing across a coral reef flat in Australia's Great Barrier Reef. This study represents the first ocean acidification experiment on a natural coral reef community and provides evidence that near-future ocean acidification projections severely depressed coral reef growth. Credit: Aaron Takeo Ninokawa of UC Davis. Ocean acidification will severely impair coral reef growth before the end of the century if carbon dioxide emissions continue unchecked, according to new research on Australia's Great Barrier Reef led by Carnegie's Ken Caldeira and the California Academy of Sciences' Rebecca Albright. 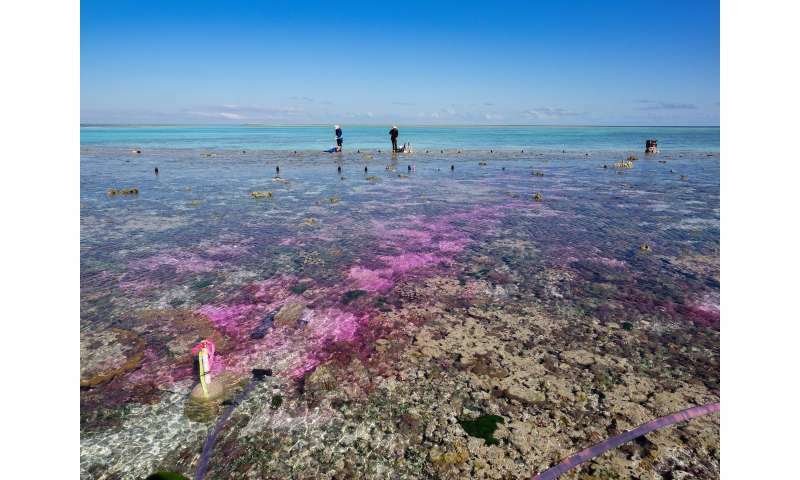 In that work, they made a coral reef community's seawater chemistry more alkaline—essentially giving the reef an antacid—and demonstrated that the coral's ability to construct its architecture was improved under these conditions. It was the first time that seawater chemistry was experimentally manipulated in a natural coral reef environment. Coral reef flat (study site) at One Tree Island in Australia's Great Barrier Reef. 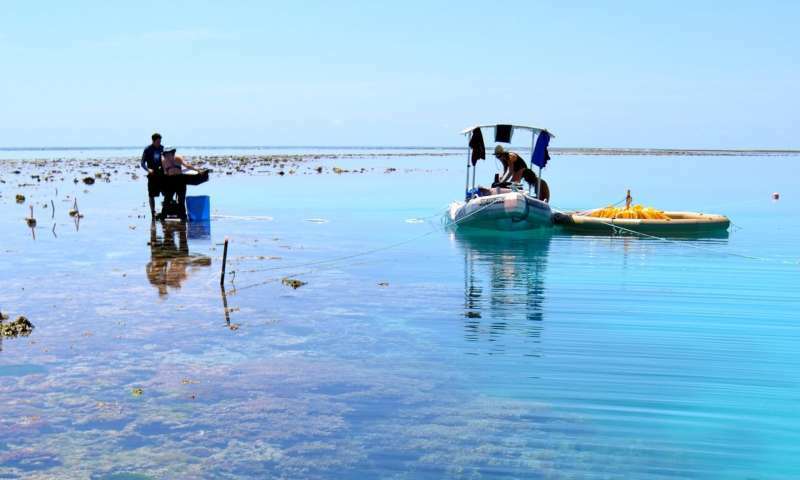 The studies conducted here represent the first in situ ocean acidification experiment of a natural coral reef community, providing evidence that near-future ocean acidification projections severely depressed coral reef growth. Credit: Aaron Takeo Ninokawa of UC Davis. Experimental set-up and research team at a coral reef flat study site at One Tree Island in Australia's Great Barrier Reef. 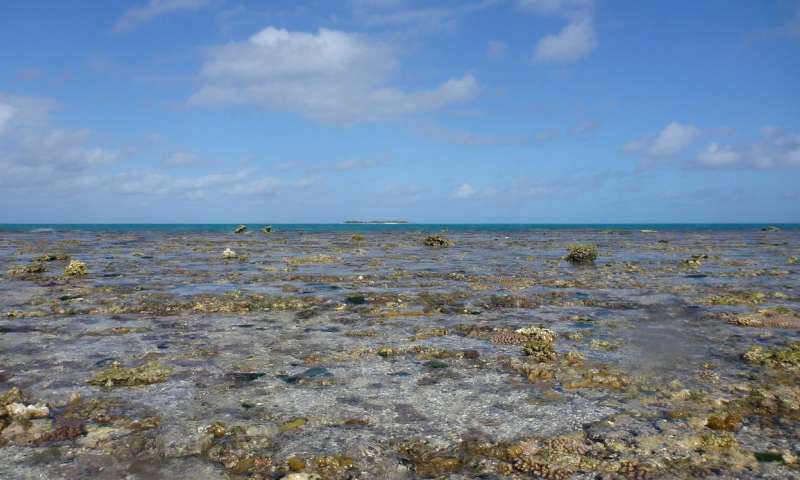 The studies conducted here represent the first ocean acidification experiment of a natural coral reef community, providing evidence that near-future ocean acidification projections severely depressed coral reef growth. Credit: Aaron Takeo Ninokawa of UC Davis.